Analog Analogue arrives in Braddock. 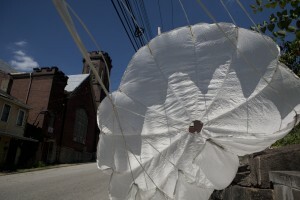 Artist group Analog Analogue were recently invited by the people of Transformasium (Ruthie Stringer, Leslie Stem, Dana Bishop-Root, Caledonia Curry, and K.T) to work on a project at their site in Braddock, Pennsylvania. We had the opportunity to work side by side with these incredible individuals in finishing a prototype of the adobe domes they constructed in post-earthquake Haiti. The town of Braddock is rich with history including the Carnegie Library, the first public library, and the Edgar Thomson Steel Mill whose gas flame indicating its operation can be seen from many of the homes. Transformasium’s imprint in Braddock is manifested in the community gardens they have started, their neighborhood screen print shop located in the Carnegie Library, and their genuine affection and support of the people and community of Braddock. We were truly inspired. Check out our album on Facebook for the adventure!